It was bound to happen sooner or later. The boom recently enjoyed by Morocco’s thriving tourism industry, the envy of less fortunate lands, was perhaps too good to last. 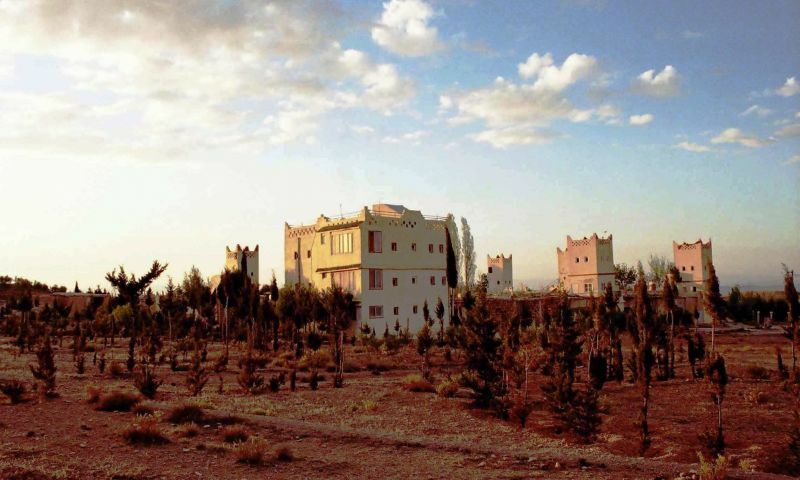 For some months, even years, ever since the 2003 Casablanca bombings, radio-trottoir (as the local rumour-mill is sometimes called) had entertained fears of similar, Al-Qaeda-inspired outrages on tourist “soft” targets in Morocco. Now, true to form, despicable terrorists have left their mark. The Café Argana, a popular favourite with visitors to Jemaa el Fna square, Marrakesh, was hit on Thursday, April 28 with fatal results. The death toll stands at 17, with a score or more wounded. Universal indignation and condemnation was clearly and justifiably voiced almost immediately afterwards when hundreds of Marrakshis took to the streets. King Mohammed VI (agellid-nneġ) was also quick to visit the blighted spot to express concern and sympathy. To a long-term European resident in Morocco, who feels more than a little affection for the country and its people, such an event is particularly sad, even tragic, striking as it does a grievous blow at the heart of its ancient, iconic capital city. The very target-name is significant. 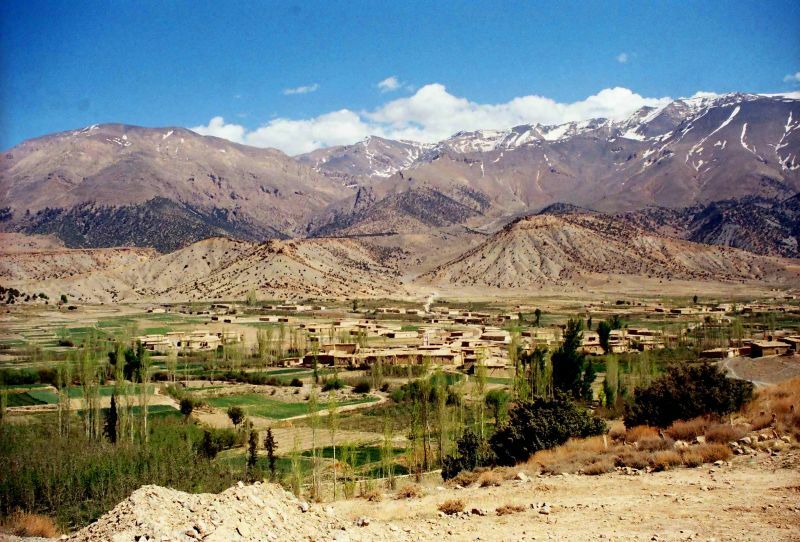 Argana, a large village at the end of the Western High Atlas, stands for the hard-working ašelḥiy community, many of whom depend on tourism for their livelihood. Argana is also traditionally famous for its large collective bee-hive, evocative of the sweetness associated with true tament (‘honey’) – not the industrial, sugar-added variety, but the authentic tabeldiyt product. Such a dire event will lead more than one to eat humble pie. Even the present writer who, holding out for small private parties visiting either on their own or through Morocco-based agencies, guides and lodges, is well-known for his critical views on foreign, TO-supported saturation tourism. In the present circumstances, while sharing the grief of those who lost loved ones, and regretting that some visitors may shelve their travel plans in the immediate future, we can but hope that there will be a speedy return to normal. With – no doubt a pipe dream – small groups of well-informed, environmentally-motivated visitors continuing without any let-up to tramp Morocco’s hills. Bear in mind that “small is beautiful” and environment-friendly. What became of those Iberian cohorts? While early-April usually witnesses the arrival en masse of Iberian off-road vehicles and assorted trail-bikes, they have been conspicuously absent this spring. With the shining exception of a convoy of a dozen Portuguese 4 x 4 enthusiasts on the motorway near Oued Beht on April 15, their national flag proudly fluttering in the breeze, as if in defiance of proposed EU economic bail-out! Not to mention several vehicles with French number plates seen near Marrakech over the April 23-24 (Easter) weekend. But that still didn’t explain where the Spanish contingent had gone to. Two weeks earlier there had indeed been long faces in Midelt. “The Spaniards are broke. 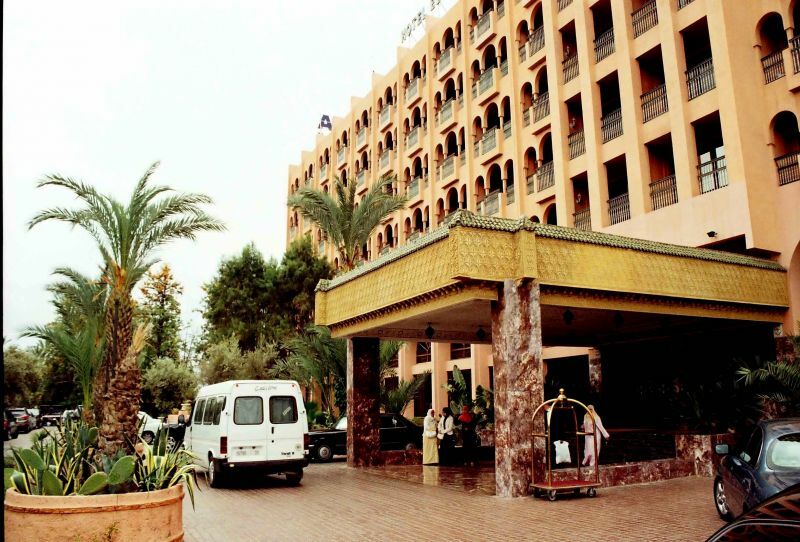 They just can’t afford Morocco this year!” we were told at the half-deserted parking lot outside the Auberge Itto Ja’afar. However, if the Spanish off-roaders are apparently taking time out in the pollution game, they are being replaced by others. On April 12, when we returned to a certain neck of the woods in the ‘Ayyachi foothills (desecrated by Malaga mountain-bikers in late-March of 2010; cf. Tour Operator Watch n° 10) it was interesting to compare this year’s pollution samples with those of 2010. 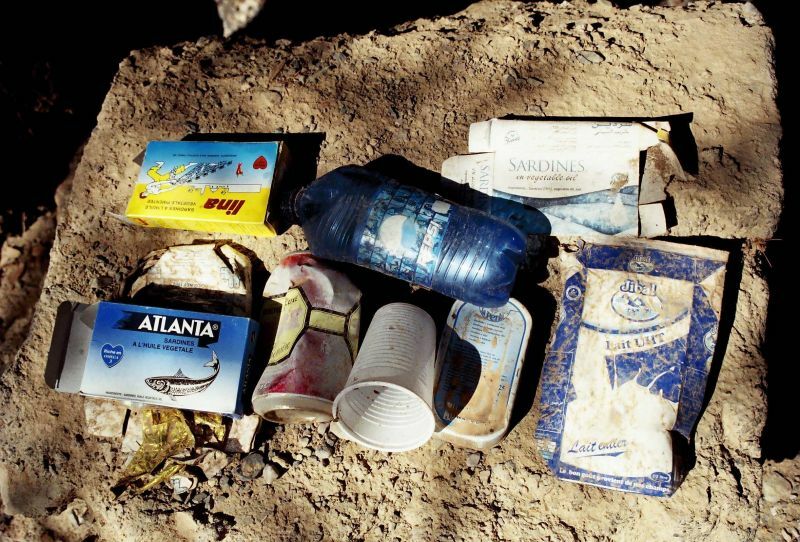 As visible evidence of Spanish absenteeism, sardine-can wrappers and other junk were mostly in French, some in Arabic, suggesting locally purchased items. Who then, were the culprits this time around? Our hunch: either French 4-WD exponents, or Moroccan workmen employed on the local forestry development project who didn’t bother to clean up after their picnic lunch. Significantly, however, use of Mitkane crossroads (Bou Ouddi) as a rubbish tip, continues unabated a year later. Such blatant disrespect for a choice woodland site is somehow at variance with the much-publicised Tounfit area development project! The present writer may be guilty of over-reacting, but he and the now threatened cedars of the Mitkane crossroads go back a long way. That’s where he came through in July 1967 on an early visit to the area, while in April 1974 he reached it on ski from the Mitkane Forestry Hut and, as he waited for his companions, even had time to shave with a blunt razor, some toilet soap and melt-water from a snowball. It was also the spot chosen by our vehicle back-up team to collect us after a first Ayyachi circuit (“le Tour de l’Ayyachi”) in August 1976. The place was rubbish-free at the time – probably because to get there you had to brave a bumpy rutted track. Since 2009, tarmac (gudrun as the Berbers call it), in connection with the Tamalout dam project, has become the thin end of the wedge. The results are all too plain to see. Snowcover on ‘Ayyachi continues to recede year after year, no doubt due to climate change. By all accounts the winter of 2010-2011 was a pretty dry one. 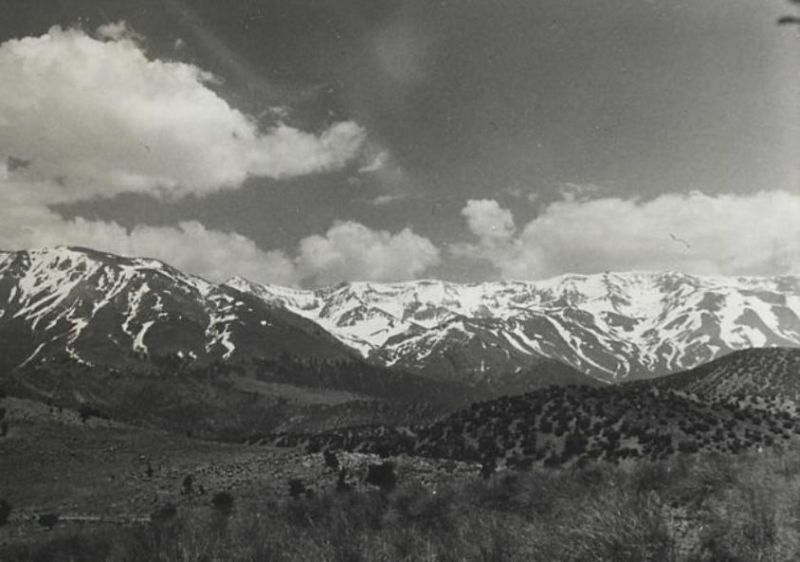 The accompanying photos of ‘Ayyachi would certainly appear to argue in favour of a marked shortfall in snowcover, especially compared to conditions in the early 1970s, memories of which are recalled as if belonging to a Golden Age! 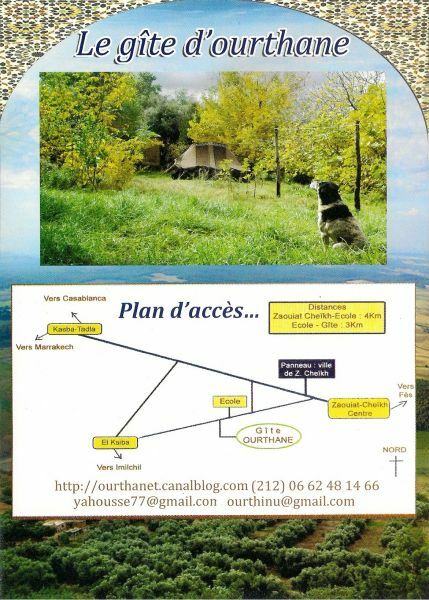 2) More on the Ourthane eco-lodge at Zaouit ech-Cheikh. 3) Update on Midelt hotels: In a previous article we came to the rescue of Midelt’s hotels which had been taking something of a bashing, mostly on trip.advisor.com. Herewith miscellaneous details and pictures on the topic. The Auberge Itto Ja’afar continues to provide comfortable beds and good food, and Saïd the owner is as friendly and hospitable as ever. However, do check your restaurant bill carefully; the Maître d’ has been known to overcharge. If you want to have a hot shower, allow the water to run for 3-4 minutes. 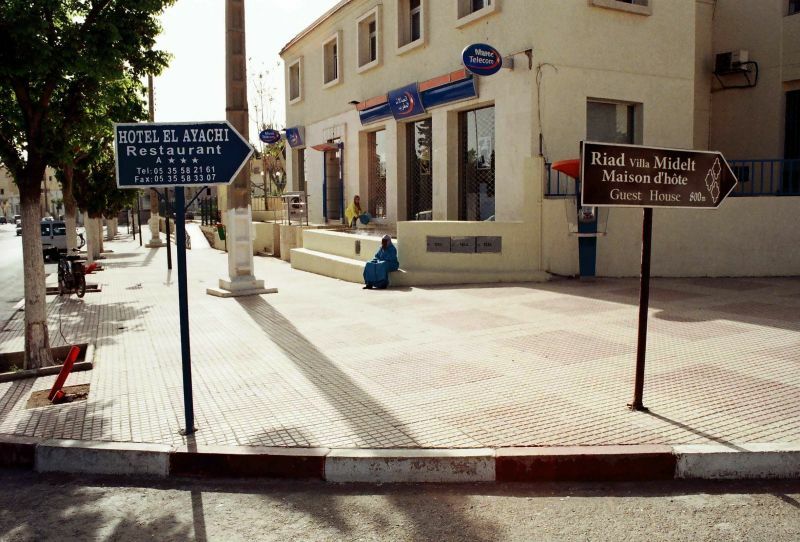 Some friendly street-corner competition appears to be raging between the classic Hotel El Ayachi and the new Riad Villa Midelt guest house, if these signposts are anything to go by (compare with « Hotel Wars, 2001″, pictured elsewhere on this website). The new de luxe Hotel Taddart is a rambling, imitation Kasbah, but a fine looking building for all that. It is situated outside of town, on the left as you arrive from Meknes. Appeared to all intents and purposes empty on the morning of April 14. In fact they’ll probably have a job filling it up, unless they can book mammoth groups. But they’ll have to encourage parties to use it as an excursion-base, and that’ll entail developing local expertise in guide-training, then reconnoitring worthwhile nearby sites for visitors. 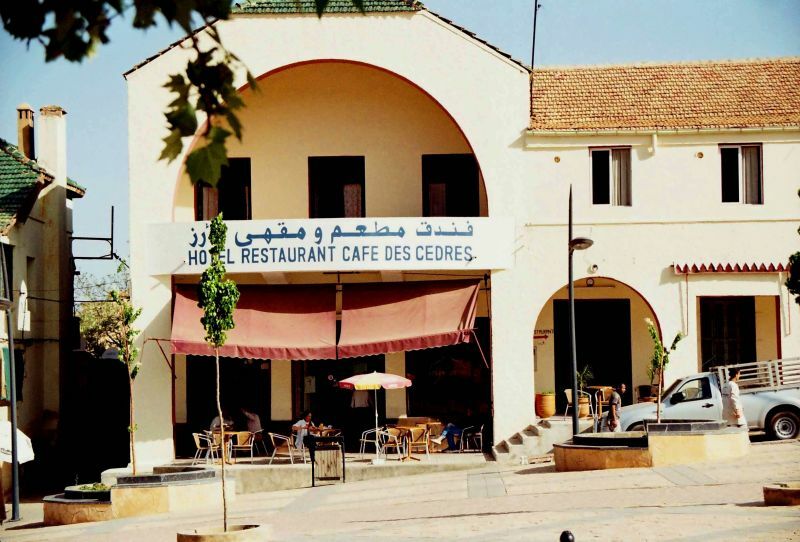 4) Azrou: the Hotel Restaurant des Cèdres, with its period furniture and reasonably clean rooms, one of which actually boasts a shower (complete with hot-water), remains excellent value for money. The restaurant serves palatable food. We warmly recommend this facility, either as a staging-point on a long trip, or as a local excursion-base. A posh, up-market sort of place, the Hotel El Andalous, boasts an attractive, tree-lined swimming-pool with constant over-flight by bulbuls, pigeons, sparrows and house buntings. Beds are comfortable, nocturnal rowdiness almost non-existent, especially in rooms on the higher floors. The now classic buffet breakfast is user-friendly, and ranges from standard Continental fare with French rolls and coffee, to full slap-up grub including eggs, cereals and what-have-you. A basement restaurant that also serves as a sort of night-club, with dimmed lights (don’t forget your specs if you want to study the menu! ), will put you out of pocket to the tune of DH 180,- for a 37-cl bottle of local Sahari wine, bread and olives for starters, and a plate of cheese-flavoured pasta as main course. However, it’s well worth it and the staff are polite and attentive. Far more basic, the good old Hotel Ali, just 50 yards from Jamaa el Fnaa, provides accommodation in the DH 200-320 price bracket (see full report on this establishment elsewhere on this website). 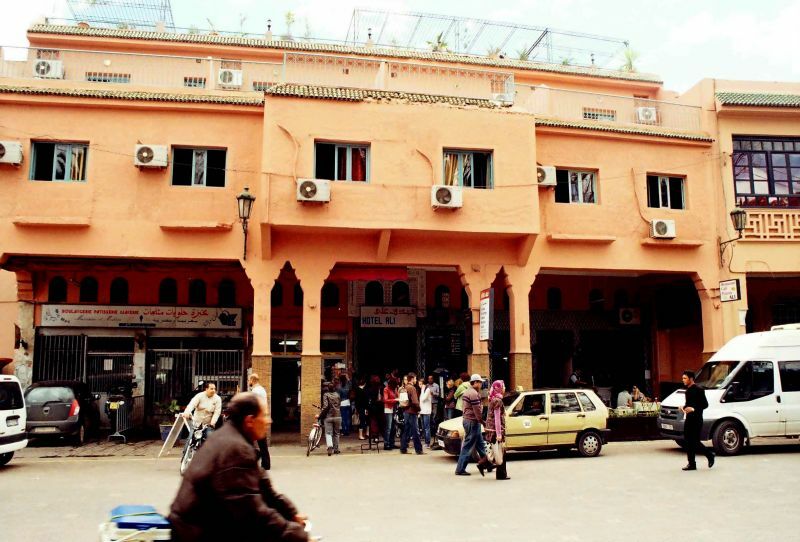 Predictably, in the wake of serious trouble across the MENA area in February of this year, and even before the cowardly April 28th bombing of the Argana Café, on Jemaa el Fna square, real estate prices in and around Marrakesh had come tumbling down. It was bound to happen sooner or later; the riad craze couldn’t last indefinitely. In early April 2011 the going price for riads, in particular, had significantly declined – in some instances by as much as 30 %! As he leaves the ramparts of the Red City and heads towards the Ourika valley the traveller cannot fail to notice the cranes standing idle at umpteen empty building sites. Supply had arguably been outpacing demand, anyway, with potentially negative repercussions on the local aquifer. The only positive angle to the present slow-down that one can possibly find is that it will bring some measure of relief to common-or-garden drinking-water – a much-abused resource; a fact of life to which silent sprinklers, jaded jacuzis and half-finished swimming-pools of de luxe housing estates bear mute testimony. What with drought in Morocco just round the corner, at least it will give the water-table a rest. However, as we shall see in the subsequent paragraph, before the April 28th explosion, Marrakesh had been weathering the on-going politico-economic storm reasonably well. It is only to be hoped that there will be no further terrorist outrages so that the return to normality may occur as soon as possible. Short-lived Easter weekend bonanza While the ranks of tourists had been thinning somewhat around the country in general, it was clear that Marrakech was acting as a heaven-sent alternative destination to all those potential visitors to Tunisian beaches and Egypt’s pyramids. 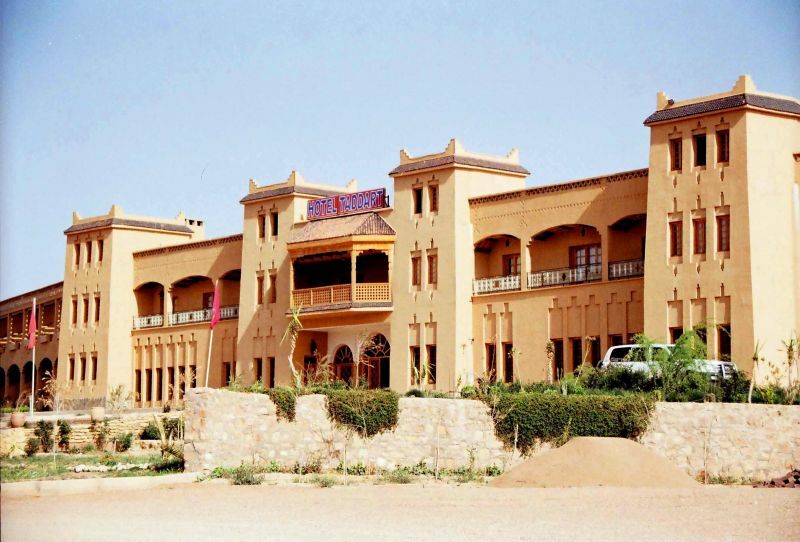 In March and early-April of 2011 reports from the Red City spoke of scarce hotel vacancies. When we visited over the Easter weekend there certainly seemed to be no dearth of tour buses; Jemaa el Fna, that famous square, was literally crawling with foreign visitors. Horse-drawn carriages did appear to be awaiting customers; otherwise story-tellers, dancers, and snake-charmers were doing a roaring trade; nearby restaurants were packed. Numerous Easter holiday vacationers from Europe had obviously been taking advantage of cheap package tickets, and were much in evidence en famille. A kind of mini-boom was under way. But it was the bikers, mostly from Britain, France and Germany, that seemed to be spear-heading this mini-invasion. Along roads leading to and from Marrakech they were surging along, their headlamps on; often as many as 15 bikes together. Nor were they absent from the Rabat-Meknes motorway and Ifrane/Azrou area. Some even roared past in a cloud of dust along a forest track as we were backpacking on April 18 south of the Michliffen resort (Middle Atlas). This dynamic presence raises hopes for the coming months. We somehow feel that the bikers, as personifications of mobility and liberty, will find it hard to neglect Morocco’s wide open reaches. Wishful thinking? Perhaps not. Anyway, only time can tell. And now, in the aftermath of the Marrakesh bombing, hopes may have been temporarily dashed. Yet is this not the time to come out of one’s corner fighting? Though it is still too early to evaluate fall-out from the Café Argana outrage, it is hard to believe that the flow of Morocco-bound visitors is going to dry up overnight simply because of that one event. That tourist intake will be curtailed there is little doubt. As a knock-on effect, hotel, lodge and guest-house bookings may not pick up before autumn of 2011. 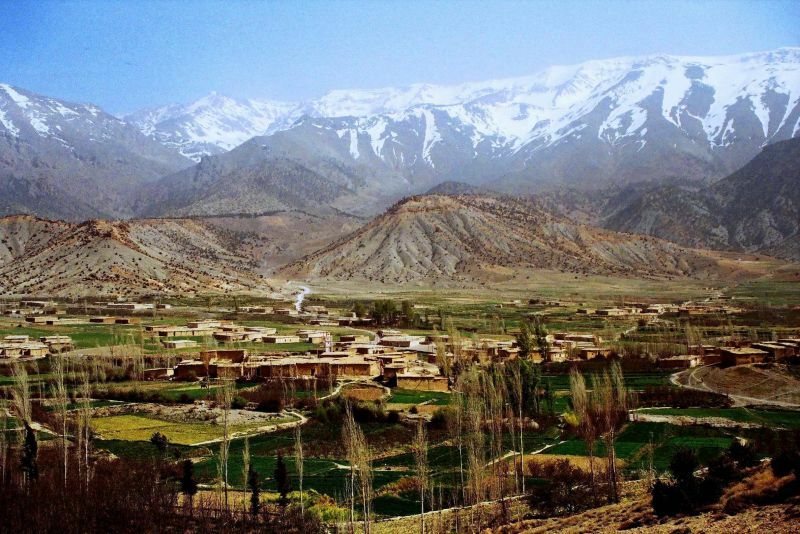 This writer, however, while monitoring the situation closely, and displaying some caution, will definitely not stay away from the Atlas Mountains. Even better, he will encourage his backpacking friends and acquaintances to do likewise. Don’t let a splinter-group of misguided killjoys govern your lives! 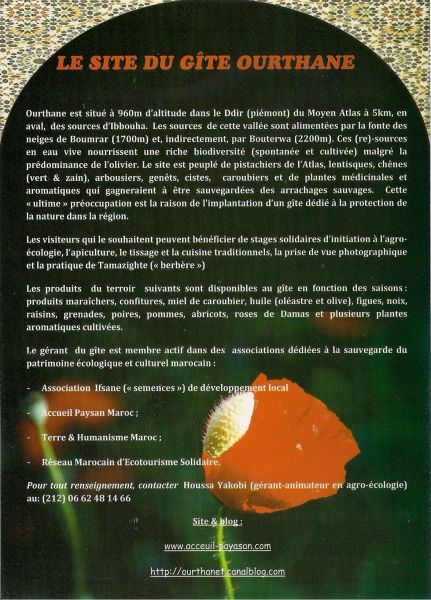 Cet article a été publié le Jeudi 5 mai 2011 à 21:32 et est catégorisé sous Tourisme de montagne Atlas marocain. Vous pouvez suivre les réponses à cet article par le fil Flux des commentaires. Vous pouvez laisser un commentaire. Les trackbacks sont fermés.